Doodhpathri (The Milk Vally) Doodhpathri is a newly tourist destination in the Indian Sate of J & K. The water which is at present flowing through the meadows looks like milk from the distance and remains very cold throughout the year Even if its Hot temp. It is located in Budgam district. Situated at an altitude of 8,956 ft from sea level, and located at a distance of 45 km Approx from state summer capital Srinagar. The name "doodpathri'' means Valley of Milk. It is said that the famous saint of Kashmir Sheikh ul Aalam Sheikh Noor din Noorani has prayed here, and once when he was in search of water in the meadows,to offer prayers, he pricked the ground with his stick to search water, and milk came out, he asked the milk that you can only be used for drinking and not performing ablution.Hearing this milk at once changed its state to water and meadow got its name DOODHPATHRI.The lush green grasses over the vast meadows and silver shining stream running over the large stones further increase its beauty. Doodhpathri is sloping grassy landscapes with a diversity of multicolored flowers up to Chang. The famous Tosamaidan lies in the west of doodpathri. 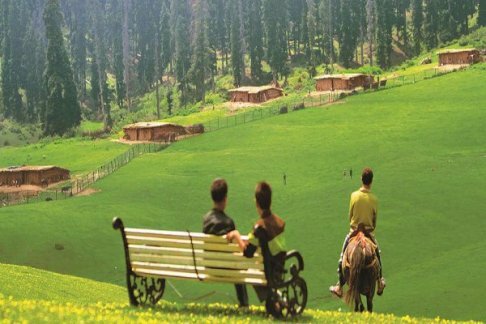 Doodhpathri lies in a bowl shaped valley in the Pir Panjal Range of the Himalayas, at an altitude of 2,730 m (8,957 ft), above sea level. It is an alpine valley covered with snow clad mountains and the meadows of Pine Fir and Deodar. The natural meadows, which are covered with snow in winter, allow the growth of wild flowers such as daisies, forget-me-nots and butter cups during spring and summer. Doodhpathri is easily accessible from Srinagar or Srinagar Airport (SXR),in under 2–3 hours from car or bus.The routes of doodhpathri are from Srinagar to Budgam, Budgam to Khansahib and Khansahib to Doodhpathri via Raiyar total distance of about 42 km. Another route is from Srinagar Gulmarg road,the route starts from Srinagar to Magam, Magam to Beerwah and Beerwah to Arizal total distance about 53 km Approx.. Horse riding is an adventure option to do while visiting Doodhpathri. Besides, it is a means of transport for tourists visiting Doodthpathri. Ponies can be hired directly or through the Tourist Office and on all the important locations of Pahalgam tariffs are displayed. Spell bounding natural setting, adventurous trekking trails, snowcapped undulated hilly terrain and the pleasant climate during springs and summers make the trekking expedition in Doodthpathri a wonderful experience. Formidable mountain ranges, amazing valleys and plateaus make the region of Doodthpathri suitable for all types of trekking, mild to very challenging. Doodthpathri has a cool and pleasant climate in summers and very cold climate in winters. The best season for Doodthpathri tourism is from April to October. (May to June) are warm and pleasant. The temperature in this hilly region ranges between 15°C and 25°C. Intermittent showers are seen during this period. There is no snowfall but snow can be found on high altitudes.